Local registered dietitian Nicole Schaldone was looking for a way to display her services and programs online for her new company Nourish to Heal. We helped the President-elect of the New Jersey Dietetic Association achieve that and more as we helped develop her brand. Nourish to Heal isn’t Nicole’s only job, as she takes having an active lifestyle to a new level. Besides helping her clients achieve a perfect balance between health and harmony, Nicole also runs a Celiac Support Group in Hunterdon County and handles The Dockside Market and Grill’s blogs, social media, and menu. 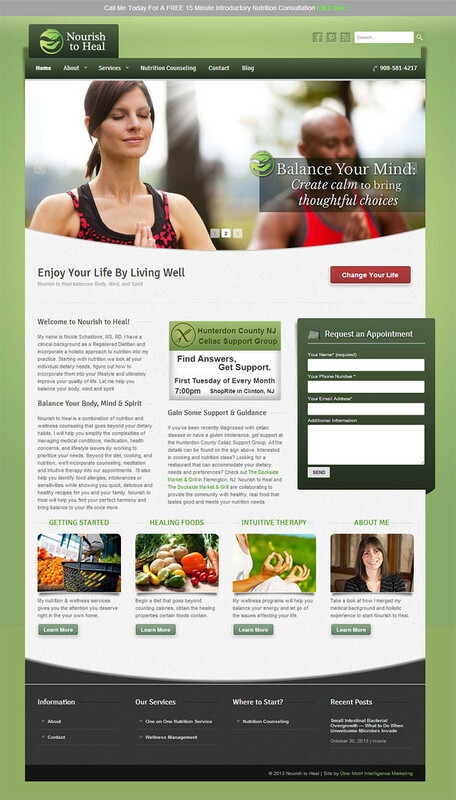 For Nourish to Heal, we gave her a complete website build that included branding, graphic design, content creation and search engine optimization. Using our collection of innovative strategies we made sure that her integrative therapy and one on one nutrition programs were being found by the right audience. Now Nicole can look forward to adding even more to her busy schedule as she helps those around her balance their body, mind, and spirit!